Titan's seasonal hemispheric dichotomy is chronicled in black and white, with the moon's northern half appearing slightly lighter than the dark southern half. 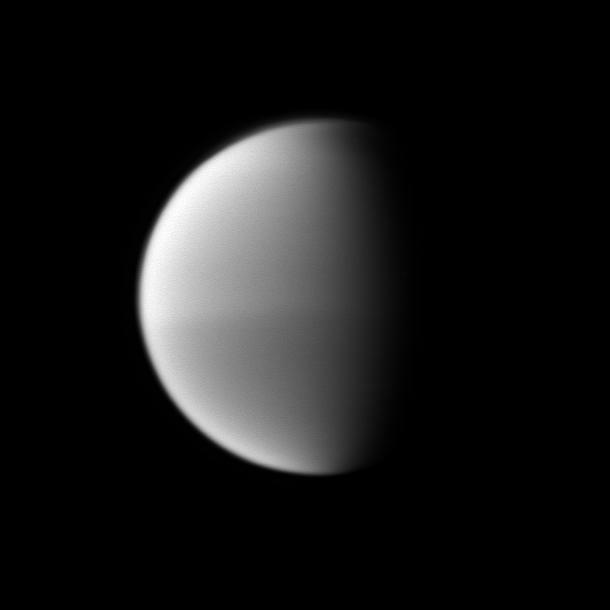 See PIA11603 to learn more about this change on Titan. This view looks toward the Saturn-facing side of Titan (5,150 kilometers, or 3,200 miles across). North on Titan is up. 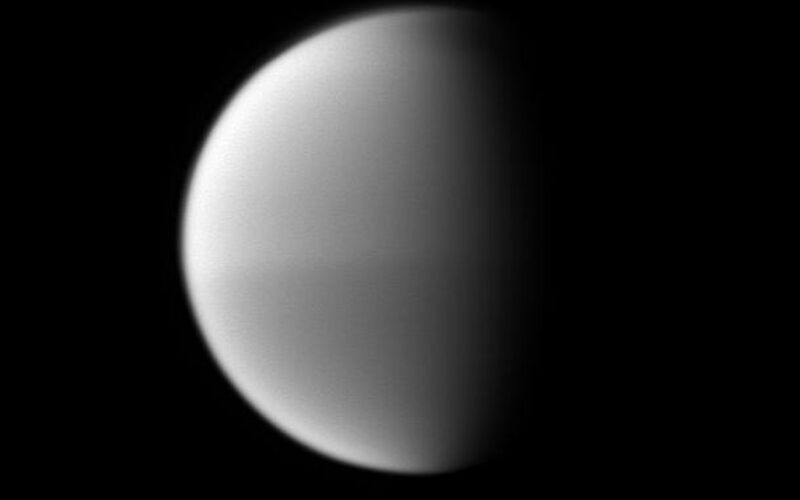 The image was taken with the Cassini spacecraft narrow-angle camera on Oct. 16, 2009 using a spectral filter sensitive to wavelengths of near-infrared light centered at 889 nanometers. 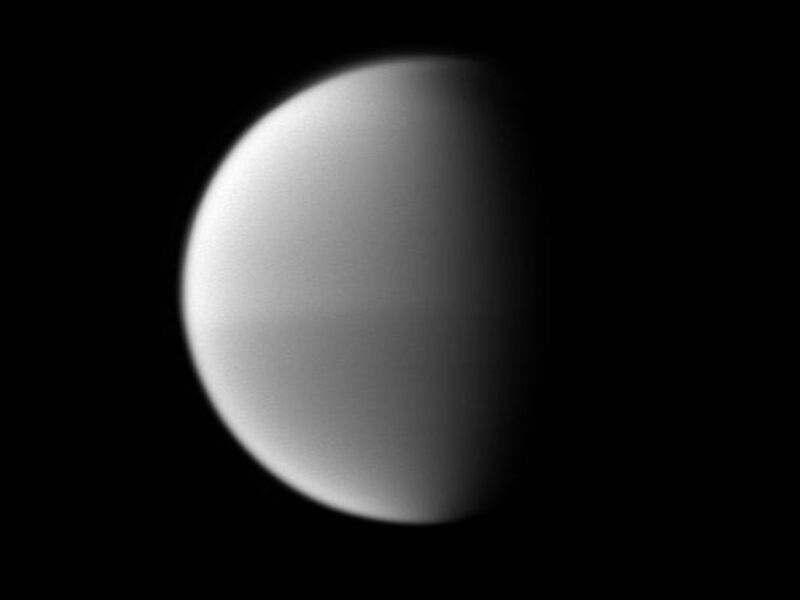 The view was obtained at a distance of approximately 2.6 million kilometers (1.6 million miles) from Titan and at a Sun-Titan-spacecraft, or phase, angle of 71 degrees. Image scale is 16 kilometers (10 miles) per pixel. The Cassini-Huygens mission is a cooperative project of NASA, the European Space Agency and the Italian Space Agency. The Jet Propulsion Laboratory, a division of the California Institute of Technology in Pasadena, manages the mission for NASA's Science Mission Directorate, Washington, D.C. The Cassini orbiter and its two onboard cameras were designed, developed and assembled at JPL. The imaging operations center is based at the Space Science Institute in Boulder, Colo.
For more information about the Cassini-Huygens mission visit http://saturn.jpl.nasa.gov/. The Cassini imaging team homepage is at http://ciclops.org. 1. Click on the screen resolution you would like to use. 2. Right-click on the image (control-click on a Mac) and select the option 'Set the Background' or 'Set as Wallpaper' (or similar). This graphic shows the ring moons inspected by NASAs Cassini spacecraft in super-close flybys. The rings and moons depicted are not to scale. This global mosaic of Titans surface was generated by combining 9,873 separate ISS images taken by NASAs Cassini spacecraft over more than 13 years of Cassini operations at Saturn. This illustration imagines the view from NASAs Cassini spacecraft during one of its final dives between Saturn and its innermost rings, as part of the missions Grand Finale.